Due to heavy snow, certain trails and boardwalks in Yellowstone National Park are temporarily closed. “The least studied mammal in Yellowstone is humans,” says Yellowstone National Park’s Social Science Coordinator Ryan Atwell. 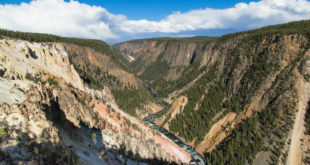 Tragic news out of Yellowstone National Park today: a young girl has died from a fall into the Grand Canyon of the Yellowstone.